Please note that the content of this book primarily consists of articles available from Wikipedia or other free sources online. Uxbridge and South Ruislip is a borough constituency represented in the House of Commons of the Parliament of the United Kingdom. 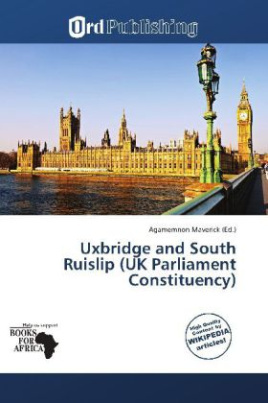 It was first contested in the 2010 general election.Formerly known as the parliamentary seat for Uxbridge, the boundaries for the constituency changed prior to the general election in 2010. Ickenham and parts of West Ruislip were moved to the Ruislip, Northwood and Pinner constituency, while it gained wards in Cavendish, South Ruislip and Manor.The following electoral wards are used in the constituency: From the London Borough of Hillingdon: Brunel, Cavendish, Hillingdon East, Manor, South Ruislip, Uxbridge North, Uxbridge South, Yiewsley.